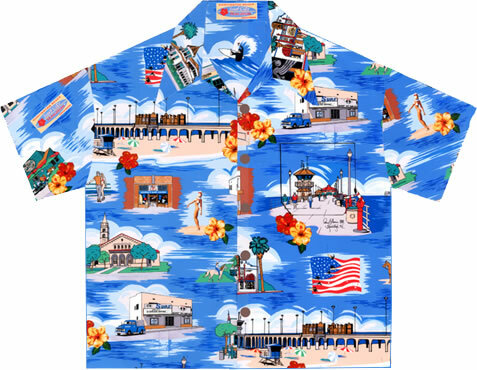 Gavin Arts Huntington Beach Surf City Hawaiian Shirts rediscovered thanks to a post on Huntington Beach Community Forum Facebook Page post. What a nice surprise. First one order, then another, then more… Kimberleigh asked the new clients why the sudden interest and was sent the HB Community Forum Page link with positive reviews of her work. The orders were great; the kind comments even better! They are available in all sizes for men, women and children and also long and short sarongs. It’s a special design with much history behind it. Paul lived and created art in HuntingtonBeach from 1975-79 in his 419 C 11th Street home studio (still there), and again in 1982–1988 in a converted Dentist’s office on the corner at 501 Walnut next door to the Surf Theater and had a work space upstairs at 115 ½ Main Street next door to Perqs. Perqs is still there but like the Original Golden Bear, the Surf Theater and other Huntington Beach Classic structures Paul’s downtown HB studios and home are now gone. During that time Paul painted many Classic Surf City scenes including the first (1982) and second (1983) OP Pro’s painted from the pier and also painted and published limited editions prints of the Golden Bear (1986)and the Old Huntington Beach Pier (1988). Then after almost 20 years in 2002 the Gavins (Paul had since met and married Kimberleigh) who had also now done military Air Show Art for years ventured into Gavin Hawaiian style fabrics for the US Navy Blue Angels, the USAF Thunderbirds and US Marine Corps and then created the San Clemente and Surf City Hawaiian Designs. Each design was created from Kimberleigh and Paul’s own original artwork and each design pattern was hand drawn by Kimberleigh. For the Surf City Hawaiian shirt she redrew Paul’s paintings of the old Huntington Pier and the Golden Bear and other sketches of buildings and people from this earlier Huntington Beach “era”, all of them part of Paul’s daily life including George’s surf shop with Jan’s smoothie stand, the Sugar Shack and International Surf Museum that was founded when Paul lived down the street in 1987. Then there are newer versions of older structures, like Duke’s that was previously Maxwell’s and a view of the new lifeguard tower and the new pier. The 1951 Ford Pickup parked in front of the Surf Theater was the same truck Paul drove when he lived there. 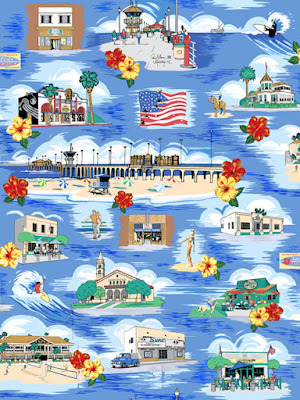 Most noticeably Huntington Beach’s world famous surf heritage and very well known Fourth of July Parade are perfectly married in Kimberleigh’s “United We Surf” image of surfers riding the stripes of Old Glory. It’s a very special and beautiful design. Thanks for remembering. They are available in all sizes for men, women and children and also long and short sarongs. Remember they are limited. Order yours now.